Roger's Beer is an amazing beer, a bit like the quintessential diplomat, suitable for any occasion! 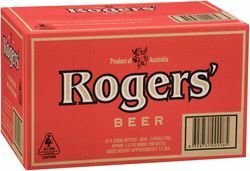 When asked by liquor retailers under which category of beer they should place Rogers in the fridge, our response can be quiet varied. It's Aussie, it's craft, it's a little dark and it's a little lighter on the alcohol content... Just like when Richard Gere asks Julia Roberts character in Pretty Woman what her name is, Rogers can similarly be what ever you want it to be! Rogers is a smooth drinking amber ale with an interesting mix of malts combined with the distinctive Little Creatures hop character. The careful balance of caramek flavours from the malt and that unique, slightly floral character from the whole hop flowers gives Rogers Beer an easy going attitude and at 3.8% alc/vol, there's no problem knocking back a few after mowing the lawn.